Named after Stockhausen’s experimental work, Kontakte have begun to put my faith back in the post-rock genre just as it started to wane. They make songs and sounds with sweet melodies that swirl around your brain without becoming annoying. They know when to pick it up and change it so that the formulas make you want to tune in without turning off. 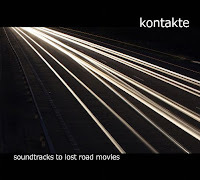 Admittedly, some of Soundtracks to Lost Road Movies is a bit familiar, but it’s recognisable in a comforting and reassuring rather than mundane or predictable way. Plus they’re a brave lot as the second half of the album is a remixed repeat of the first - with the remodelling coming from a host of Drifting Falling label-mates (clicky). I say brave as some of the remixes verge on outdoing the originals. This is especially the case with the two below: Electric Loop Orchestra’s reworking of ‘Ghosts of Electricity’ has definitely got the potential to send you psychotic with its weird reversals; and the Winterlight remix of ‘Life’s Road Movies’ is utterly beguiling and beautiful and could well be one of my tracks of the year. Listen to both loud. People, this is really very good.